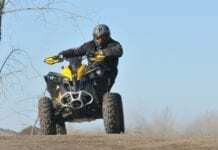 For those of us lucky enough to live in the parts of North America where it gets truly cold for a major part of the year, the idea of riding an ATV can be downright miserable. It just gets cold and that can make your hands freeze on the handlebars and more. 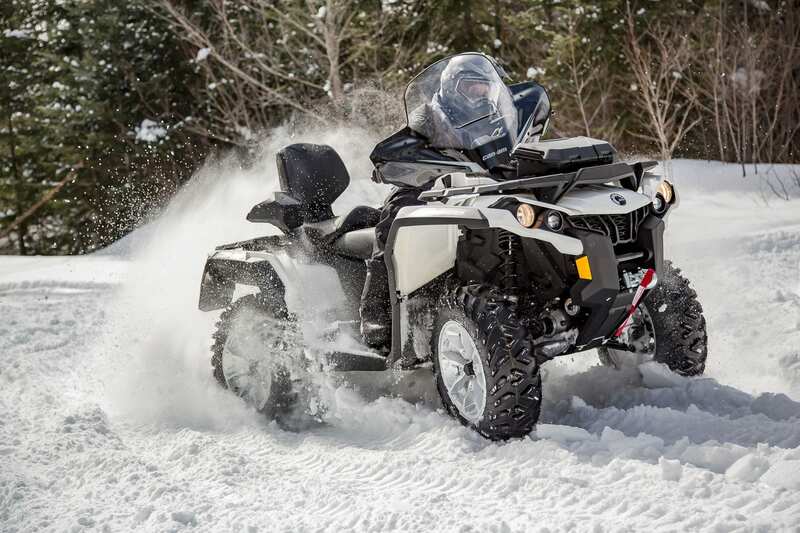 Wouldn’t it be nice if a manufacturer made an ATV that was specifically designed to handle the cold weather of the Northern regions? Well, we are in luck then, because Can-Am is a Northern-based company and they understand our plight. Through this understanding, they produce the Outlander 850 North Edition. We’re saved! 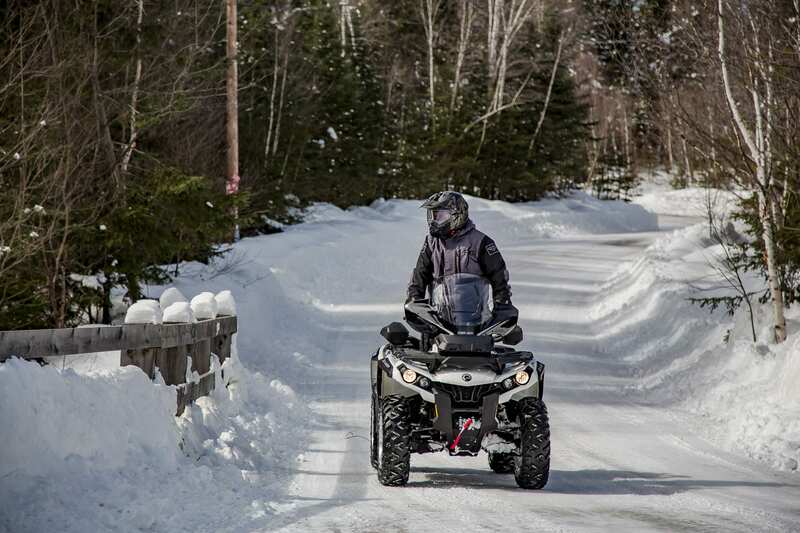 The Outlander North Edition is outfitted with accessories to make it a perfect choice for the rider looking for a year-round machine that can tackle the snow in the winter, and mud in the spring and fall, all while helping to keep you warm and dry. Does it succeed? It does. In fact, this may be our new favorite Outlander ATV. 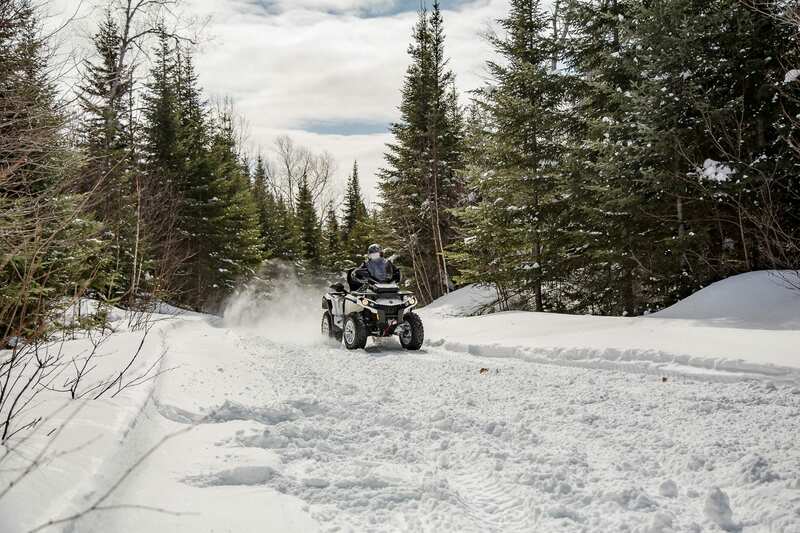 The Outlander North Edition borrows some technologies from the Ski-Doo side of BRP to create what may be the ultimate ATV for snow and cold. From first glance, you can notice a few striking differences between this machine and a standard Outlander. First, you’ve had to have noticed the color. The North Edition only comes in bright white, which creates a stark contrast to the black racks, seat cover, extended fender flares and motor fairing. It’s simple, but sharp. Then there are the 14-inch aluminum wheels with white powder coating that really pop with the fenders and other plastic. Let’s not forget the tall windshield with handguards, too. From Ski-Doo, the Outlander North Edition gets some nice heated grips and a heated throttle to keep your hands nice and toasty warm. In fact, these grips are almost too hot if turned all the way up, so keep that in mind. It was a nice touch for us as we could get away with wearing thinner gloves while riding. The Outlander North Edition also has a plug in for a heated visor on your helmet, which is a vitally important thing if you wear a full-face helmet in colder regions as it will eliminate visor fogging. The Outlander North also comes with extended fender flares. There’s several reasons why we really like this. First in the spring and fall, when we hit some mud, it helps keep it off the machine and away from us. It can be hard to keep those white plastics white if their covered with mud all the time. In the winter, it really helps keep the snow from blowing all over you. This is a very important element, as anyone who rides in the powdered goodness knows well. It’s really hard to keep warm when snow is covering you. 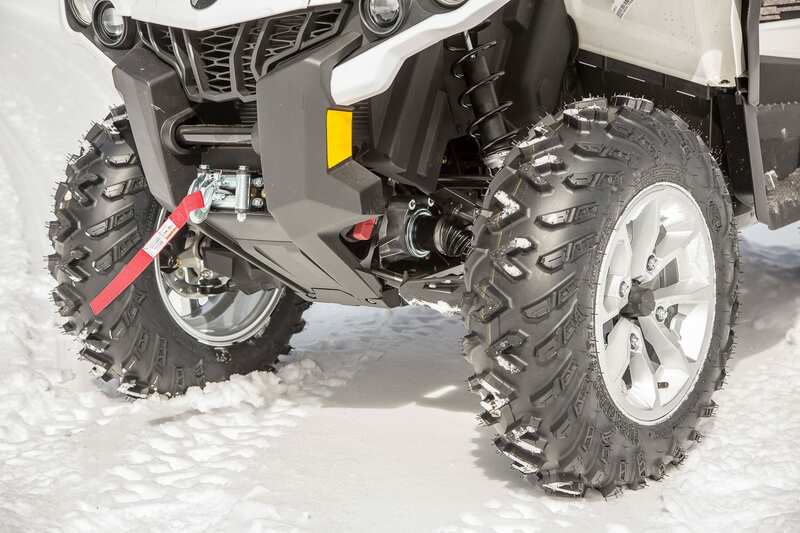 The fender flares are also a necessity if you’re going to add Can-Am’s optional Apache track system. The snow track setup will turn this beast into a backcountry tank capable of going just about anywhere in the snow you’d care to go. The tracks kick up a lot of snow though so you will really appreciate the extended protection. If you keep the stock tires and wheels on, you’ll find you have some good traction too. In addition to the cool-looking white wheels, the North Edition Outlander comes with ITP Terra Cross tires. 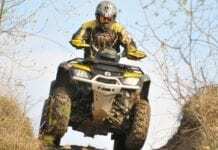 These tires have aggressive tread that works well in a wide range of conditions, but as we know from other rides on other machines with them, they offer a very smooth ride if you’re on harder trails or pavement. The North Edition Outlanders come in two different engine classes. You can pick from a 62 horsepower 650, or, as our test machine is, the fun 78-horsepower 854cc Rotax V-twin of the Outlander 850. This engine in this platform is exceptional. It is fed through Can-Am’s electronic fuel injection system and runs through a CVT transmission. It is nearly flawless in power delivery and it provides a very smooth ride. One question we got from several people we met on the trail was, “Why isn’t is a 1000?” The answer really shouldn’t come as a surprise to anyone. Just look at the machine. It’s set up as a smooth-riding trail cruiser. You don’t need the bigger engine when it’s freezing cold out as it is. Everything about this machine is made and designed for a smooth ride and comfort. Besides, the 850 engine, and the 650 for that matter, are nothing to sneeze at when it comes to horsepower. The only real reason to consider putting the 1000R engine into this platform would be the Apache tracks. Tracks have a tendency to rob some horsepower, so we could see a case to justify putting the biggest motor they can into this set-up, but honestly, only if they had the tracks on and made it a snow package. 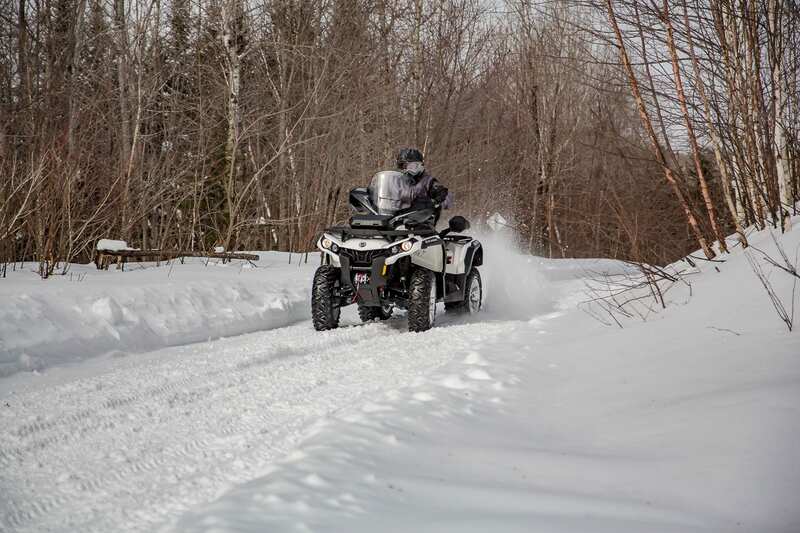 That would open up a whole other discussion about legalities, trails and access, so we’re happy to have Can-Am keep the North Edition machines as they are. One other additional feature found on this machine is the 3,000-pound Warn winch. This is part of the XT package on the standard Outlander and is very welcome on this machine, too, for a couple of reasons. If you are like us, you use your ATV for plowing snow. While you can get away without a winch to an extent, having one makes the job much, much easier. Here’s the kicker, though. A lesser winch can wear out very quickly with the repetitive nature of plowing. Coming from the factory with a premium winch from Warn ensures that won’t be an issue for you. We’d like to see Can-Am switch to synthetic rope over cable, though. Not a deal breaker by any means, but if we were buying this machine, we’d make the switch. It just makes things easier and nicer. The Outlander North Edition has excellent suspension. Up front, the dual A-arms carry 9-inch (22.9cm), oil-charged shocks. 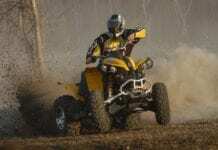 Out back, there is Can-Am’s independent torsional trailing arm setup with 9.3-inch (23.6cm) shocks. 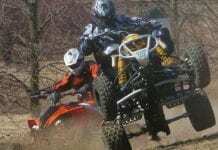 The ride quality is very good and nearly perfect for trail cruising and spirited trail riding. The front rack will hold 45kg (100lbs.) of stuff. The rear will carry 90kg (200lbs.) of gear. The racks are a composite type with a steel reinforcement for durability. Towing is rated at 590kg (1,300lbs.) with a standard mount. We wouldn’t mind seeing a receiver-type hitch on this machine, like the Outlander Mossy Oak Hunting Edition has. It just makes things easier and more convenient. Like we’ve been saying over and over again, this is a machine designed for cruising. At that, it excels. The Terra Cross tires roll over the trails smoothly and while they do a great job at grabbing traction, they don’t kick up an excessive amount of mud and trail debris. They also do a great job at taming some of the trail noise on hard pack trails. And by hard packed trails, we’re also talking about frozen trails and ice. Come on. This is the North Edition and we definitely live in the North! We took our test unit out in the freezing cold to see how it handles and we hit some pretty rough trails to see how well it would handle. We took another machine along that was not as well equipped for the conditions and we all ended up fighting to see who could ride the Can-Am. Power delivery was very smooth for the conditions too, but it is a Rotax V-twin, so it doesn’t take much to unleash things a little. 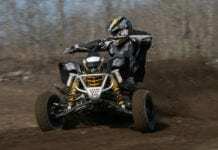 If you haven’t ridden a Can-Am, or a machine with a solid V-twin before, you simply must try one out. A little stab at the throttle and the motor growls to life, turning this tame trail cruiser into a raging polar bear. A little tip from personal experience – wear a full-face helmet when riding this machine. You’ll end up smiling a lot, especially when you get on the gas, and when it’s freezing cold out, your teeth will hurt from the exposure. 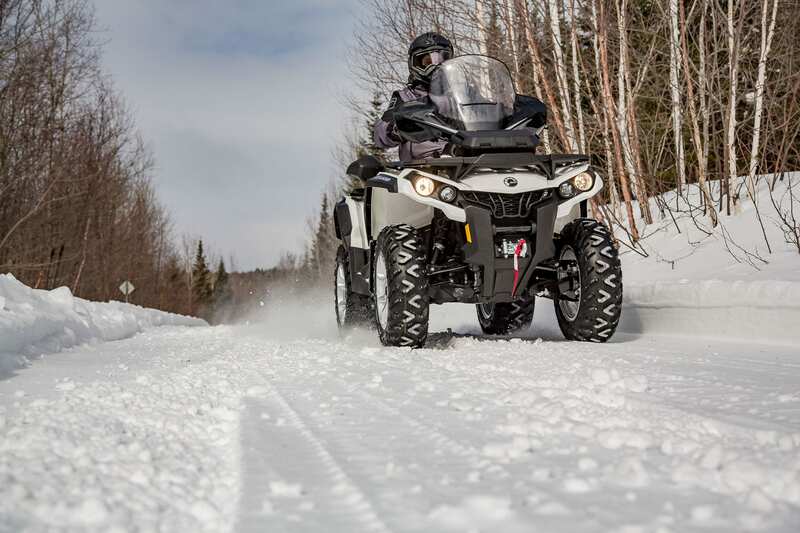 Overall, the Can-Am Outlander 850 North Edition is a great machine and one of our favorites for cruising the trails and frozen lakes of the Great White North. It is a comfortable machine with plenty of power on tap and features that help take the bite out of the cold temperatures. It is also one of the more stunning machines visually that will grab your attention. It helps make this a great year-round machine for anyone looking for a new ATV.